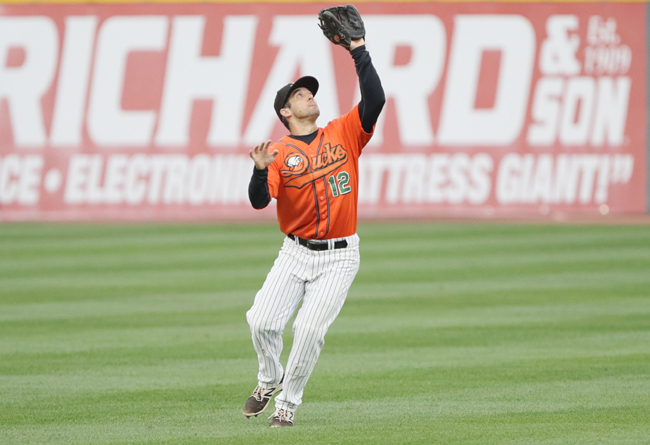 (Central Islip, N.Y., Jan. 25, 2018) – The Long Island Ducks today announced the signing of shortstop Dan Lyons. He will begin his eighth season as a member of the Ducks and 12th in professional baseball. Lyons has spent each year with the Flock since first joining the team in 2011 and has accrued a plethora of accolades. He is a three-time Atlantic League All-Star (2012, 2015, 2016) and a two-time Post-Season All-Star Team selection (2012, 2015). He was also chosen as the league’s inaugural recipient of the Rawlings Gold Glove Defensive Player of the Year Award in 2015. The 33-year-old won back-to-back Atlantic League Championships with the Ducks in 2012 and 2013. He was named the Championship Series Most Valuable Player in 2012, recording a pair of game-winning hits during the series including a walk-off bunt single in the decisive Game Five. In addition, he has led the Flock to six postseason berths and five Liberty Division Championships in his first seven seasons with Long Island. The Minnesota native played 122 games during the 2017 season, compiling a .248 batting average, seven home runs, 37 RBI, 47 runs scored and 19 doubles. Defensively, he led all Atlantic League shortstops with 184 putouts and ranked second with 331 assists. The University of Minnesota alum went on to add three RBI, three runs and five walks in seven postseason games, helping the Ducks to their second consecutive Division Championship. Entering 2018, Lyons has played 795 regular season games with the Ducks, leaving him just 68 shy of tying Ray Navarrete for the all-time franchise record (863). He has amassed 689 hits, 319 RBI, 384 runs, 128 doubles, 33 triples, 34 home runs and 70 stolen bases in his Ducks career.